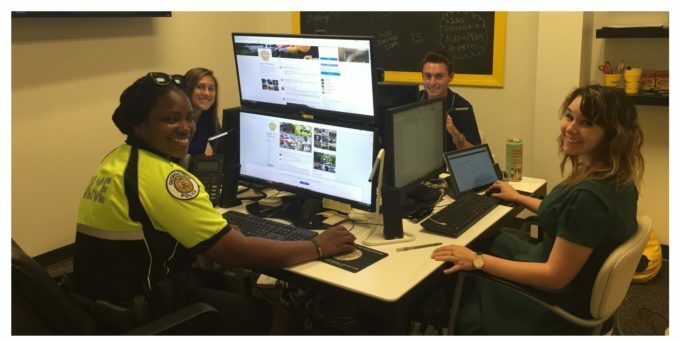 It’s possible your police department has a page on Facebook that no one associated with the department created. I’m not referring to pages created by impersonators. That’s a different Quick Tip. However, sometimes pages are created by Facebook when someone selects an associated interest or when someone checks in to a location. Those pages are called Community Pages, and they’re accompanied by a briefcase or a geo-location pin as an icon. For example, search “Sacramento Police” on Facebook and, in addition to the real department page, you’ll find a page Facebook created. 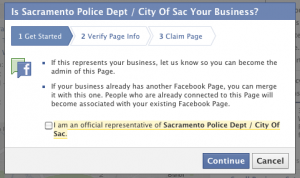 If such a page exists for your police department, you can claim it. First you must convince Facebook that you’re the official representative and become the admin. Then you can merge it with your real page. In the upper right corner of the page, click on the round asterisk-looking pull-down menu. Select Is this your business? Fill in the information and click Continue. You will then have to choose a method to verify you can claim the page. Once Facebook reviews your request and accepts it, you’ll be made the administrator of the page. You can then merge it with your current page. To merge two pages they must have similar names and the same address. Go to the page with the most Likes. If you have two pages that qualify to be merged, you will see a link offering you to Merge duplicate pages. When completed, the Likes and Check in From the page with the fewest Likes will be incorporated into the page with most Likes. Everything else on the old Community Page will go away.